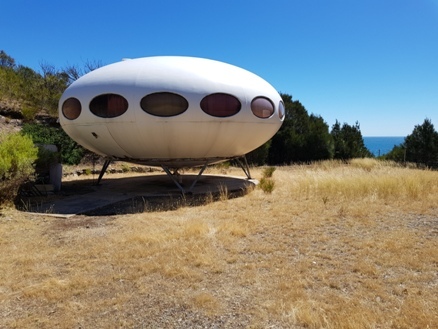 Between November 2017 and March 2018 Peter S travelled thousands of miles and visited this Futuro as well as those in Canberra, Cheltenham, High Wycombe and South Morang. 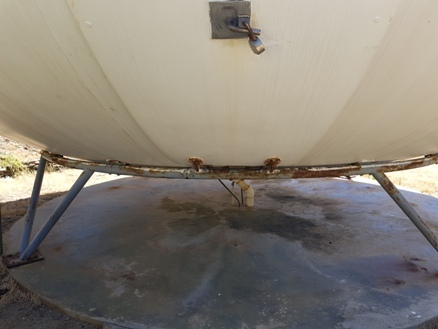 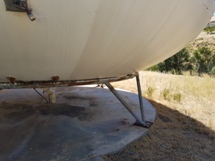 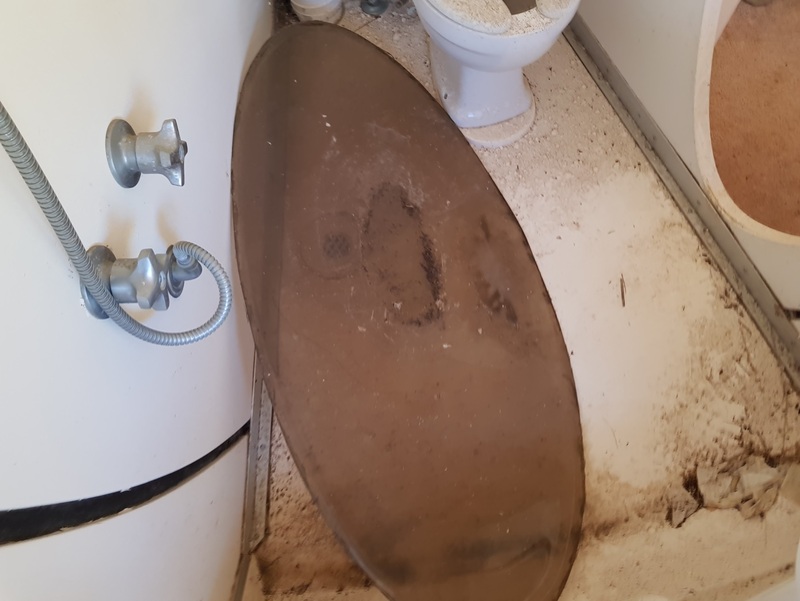 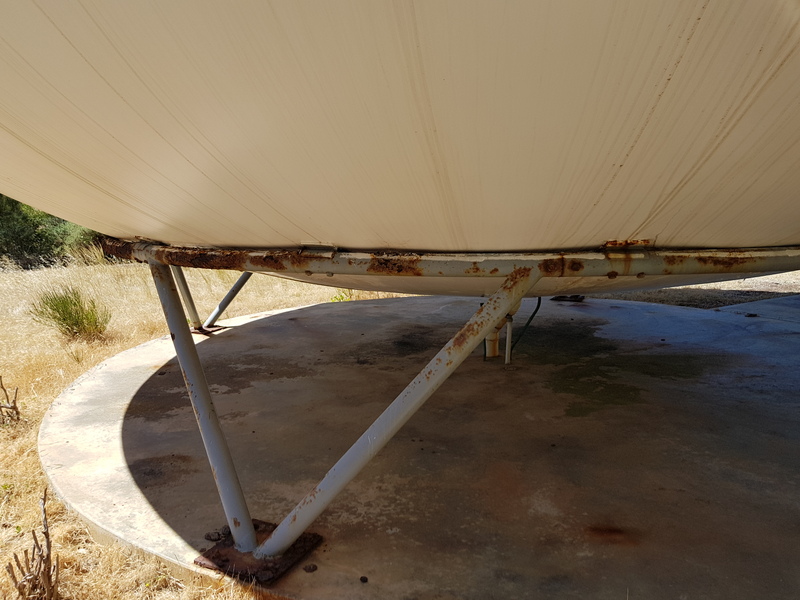 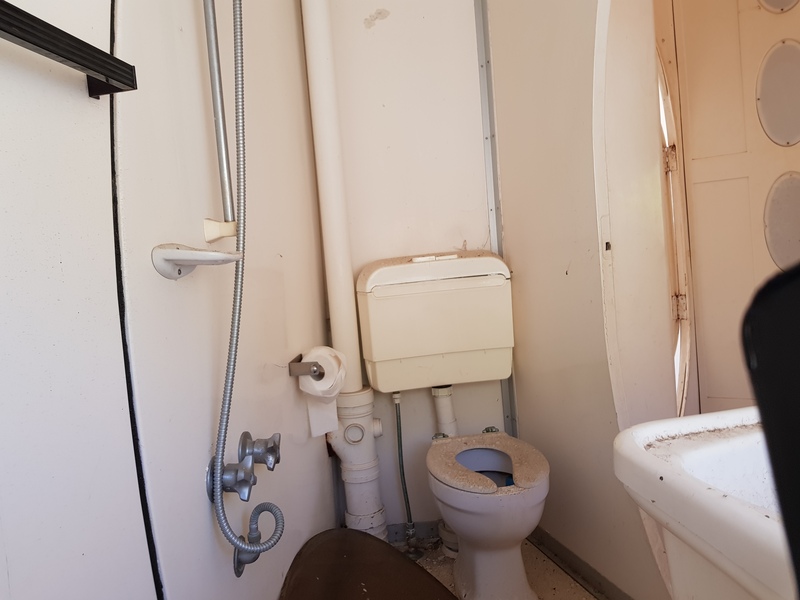 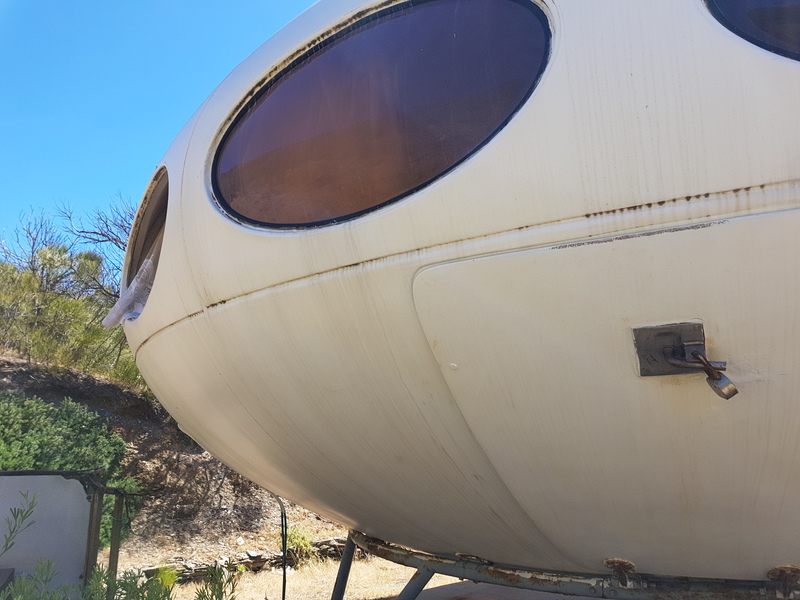 He visited this Futuro on 122617 and the photos below document the appearance and condition of the Futuro's exterior and interior at that time; Thanks for sharing Peter. 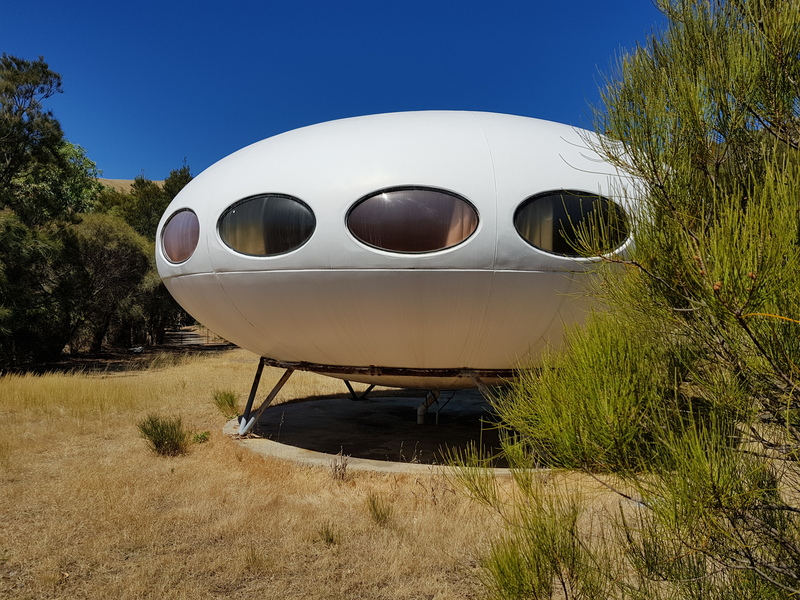 Scott McCarten, who runs the Urban Exploration blog Autopsy Of Adelaide recently had the opportunity to visit and photograph this Futuro. 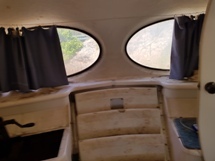 These photos, published on Scott's blog 082917, provide a great look at the Futuro's interior. 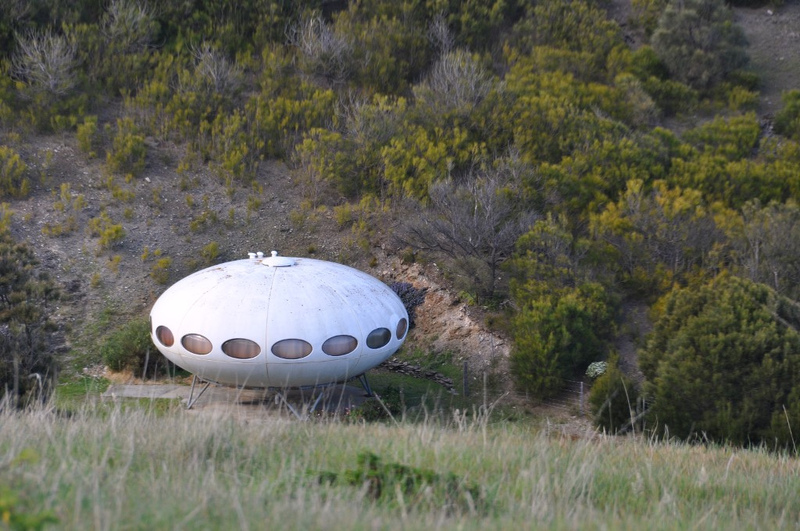 They are shared here with Scott's permission; thanks Scott. 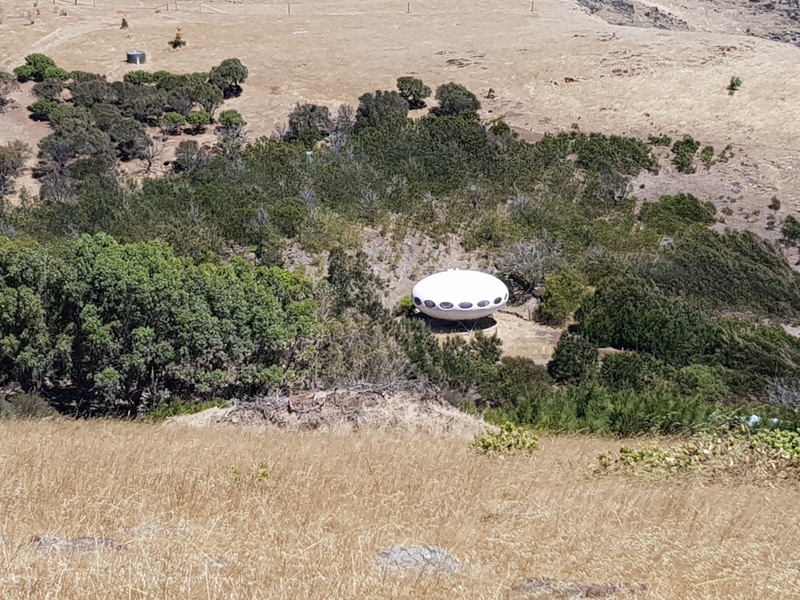 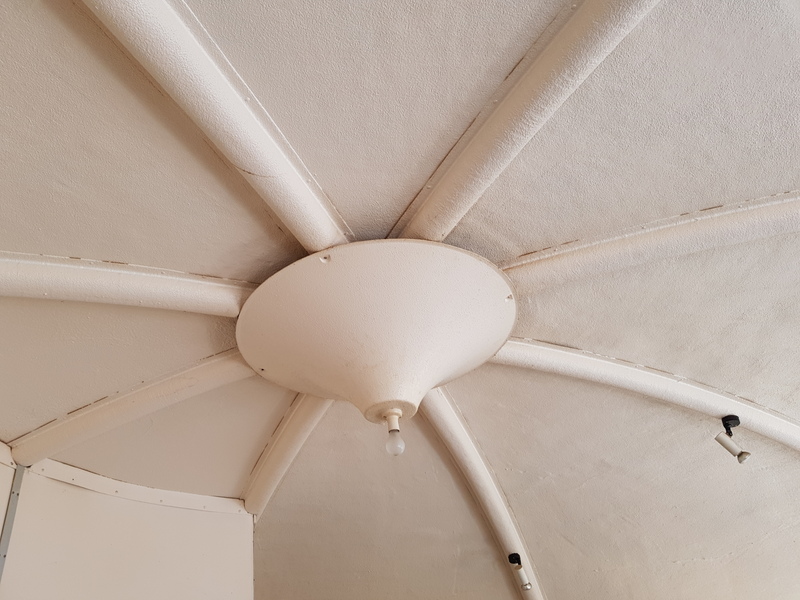 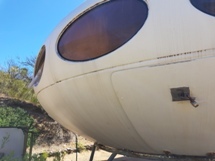 Interesting to note from Scott's blog post that the Futuro is currently undergoing refurbishment and restoration as part of the development of a nature retreat on the property by owner Joe Emanuele. 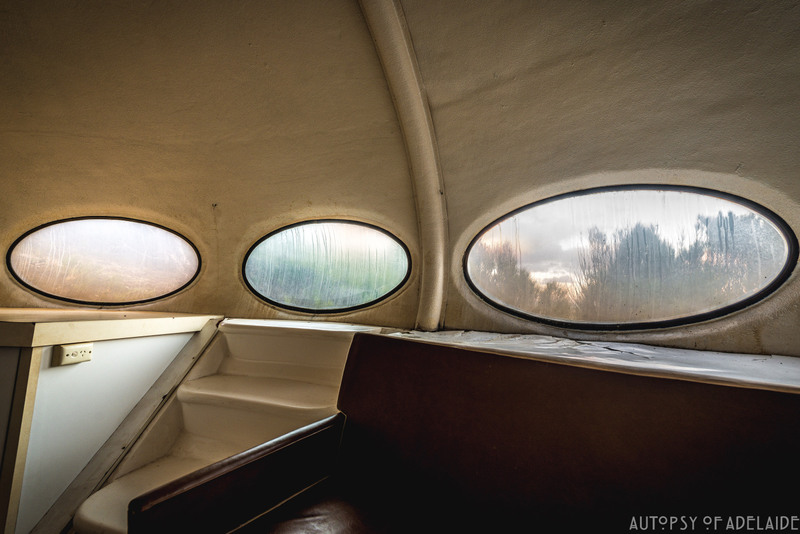 These two photos, by MaxPritchardGunner Architects, show this Futuro as it appeared on 040716. 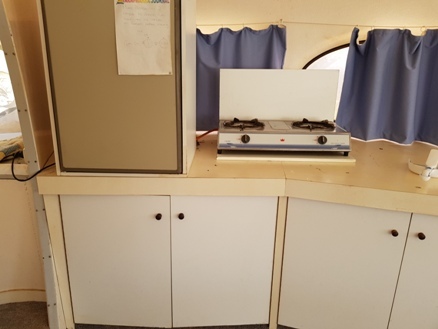 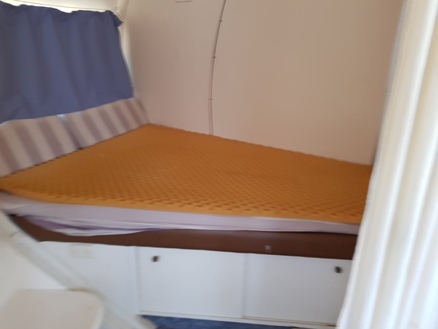 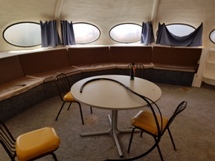 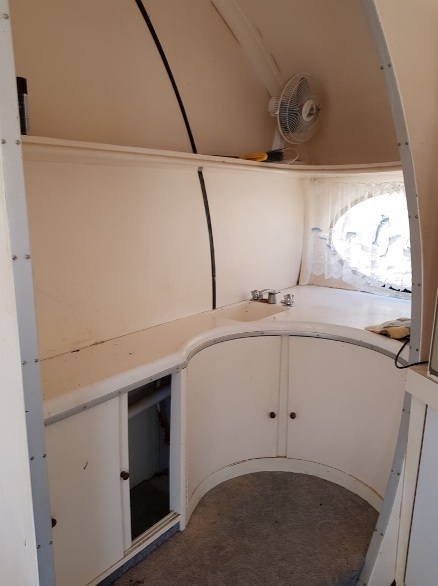 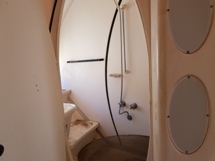 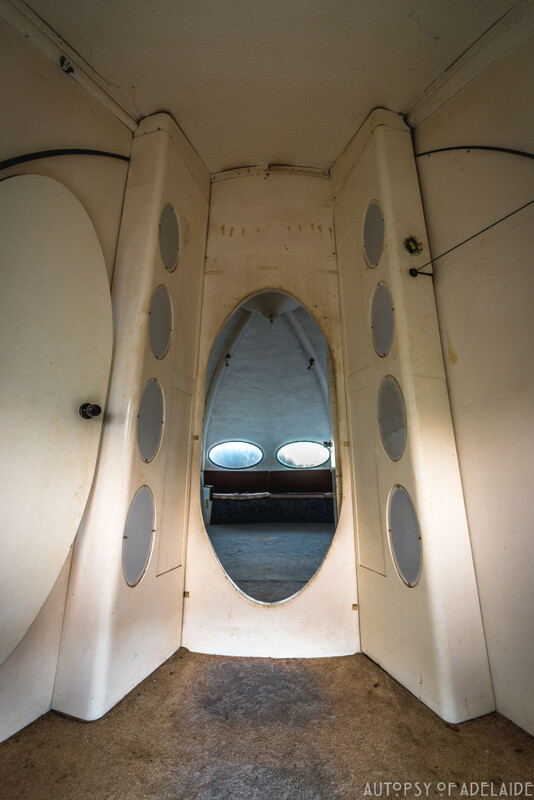 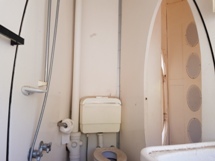 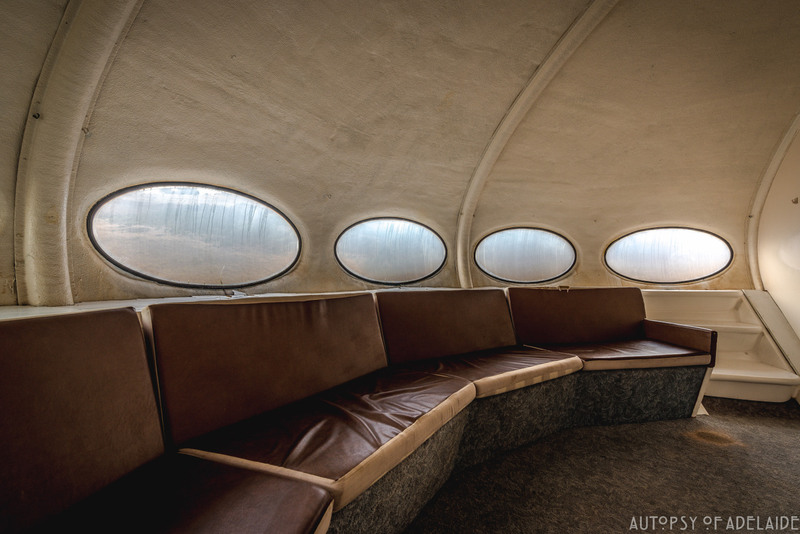 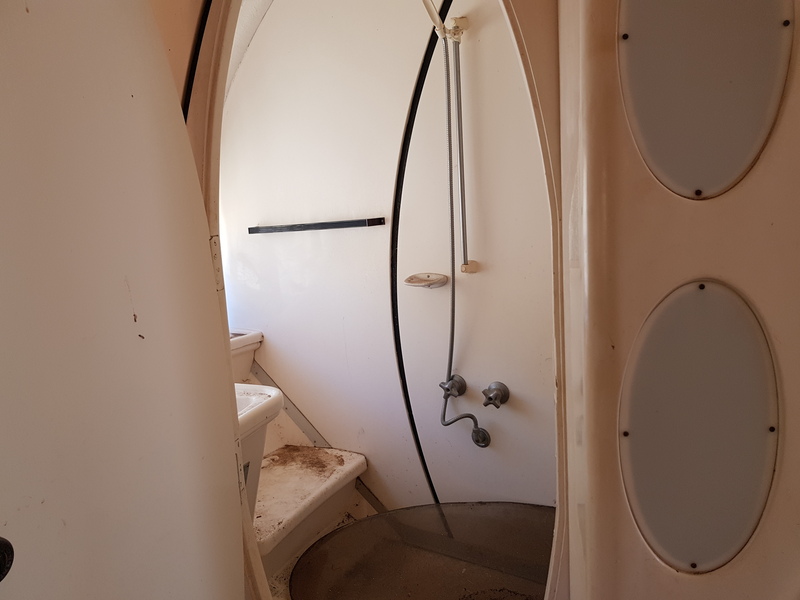 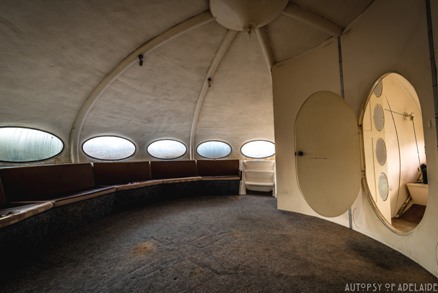 The second photo provides the first interior view I have seen of this Futuro and, though the view is limited, it looks like the interior is as well maintained as the exterior. MaxPritchardGunner Architects original photos were posted to Instagram and can be found here and here. 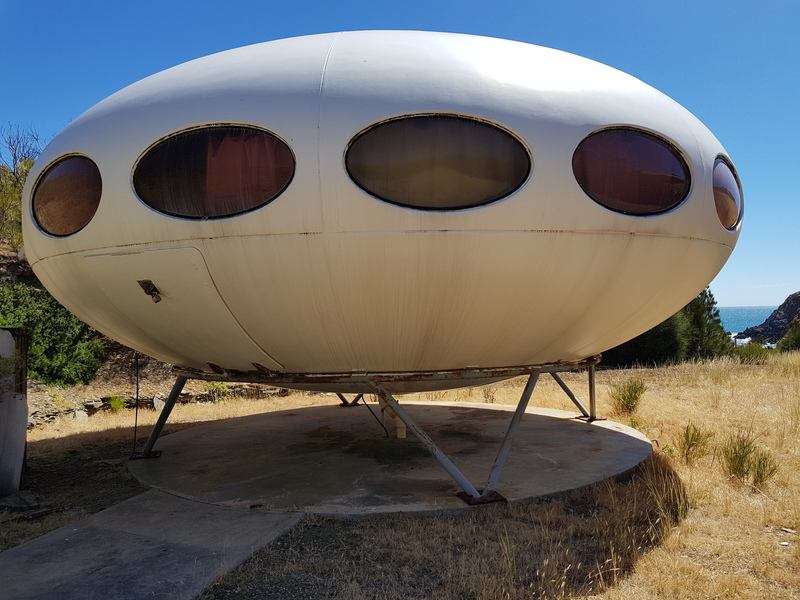 Sharon P. sent me the photo below [thanks Sharon] which shows this Futuro on Melbourne Street in Adelaide, South Australia in the early 1970's. 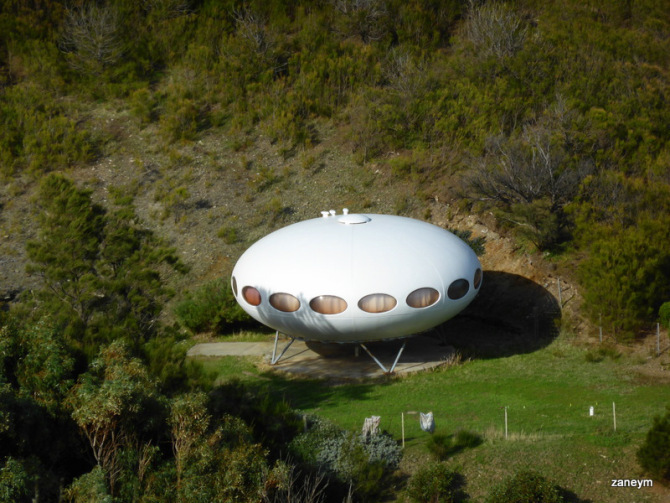 This is the only photo I have seen of this Futuro at its original location. 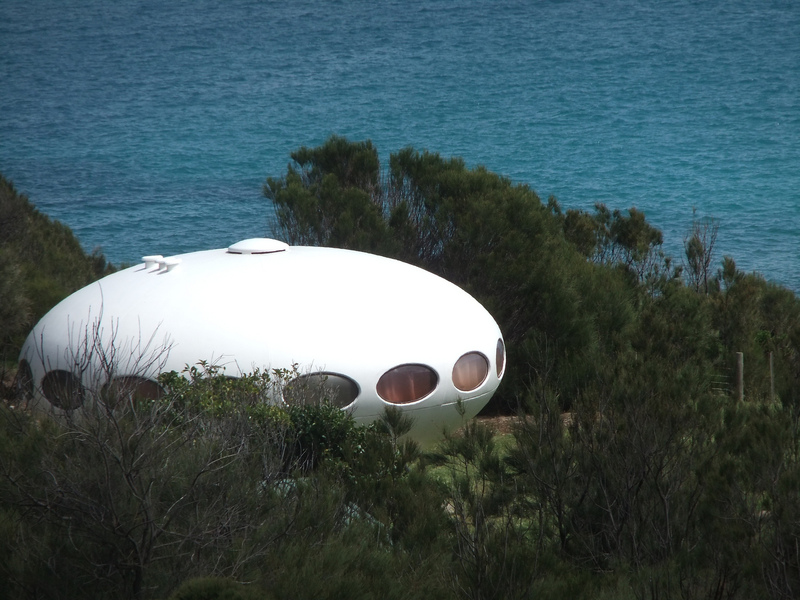 I am not sure where the photo originated, possibly on adelaidenow.com.au but that is a subscription site and I do not have a subscription, so if anyone can point me in the direction of the "owner" of this photo I would appreciate it so that I can provide proper attribution for its use here. The photo below is courtesy of P. Johnson Tailors [Melbourne & Sydney]; it is probably the most interesting photograph I have seen of this Futuro; almost "other worldly" in appearance.. It was posted to Instagram by [pjohnsontailors] back in July 2013. 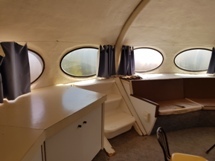 The original photo can be found here. 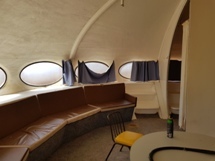 The two close up photos below were captured by birdsrule on 090513 and are shown here with permission. 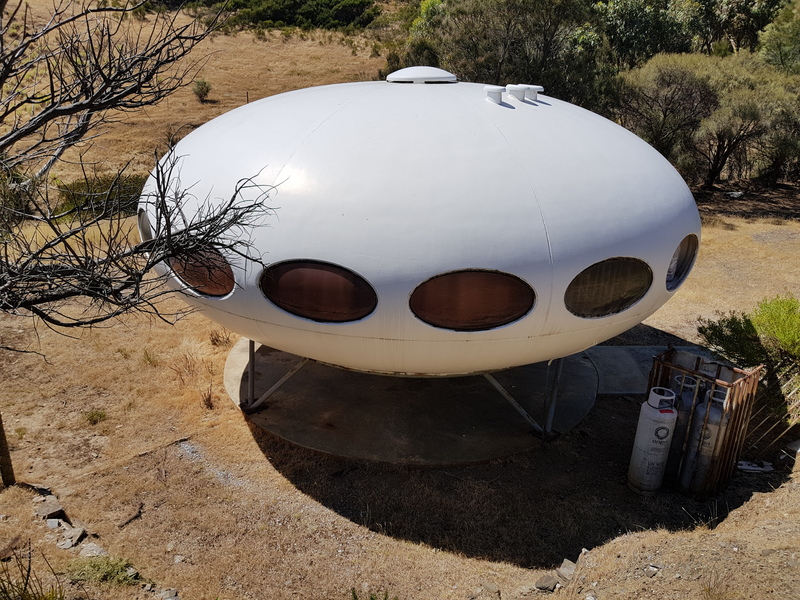 These four photos were taken by Choppy123 and accompanied an 061113 blog posting titled "Futuro House (UFO House) here in Adelaide." The photos are shown here with permission - thanks Choppy123. 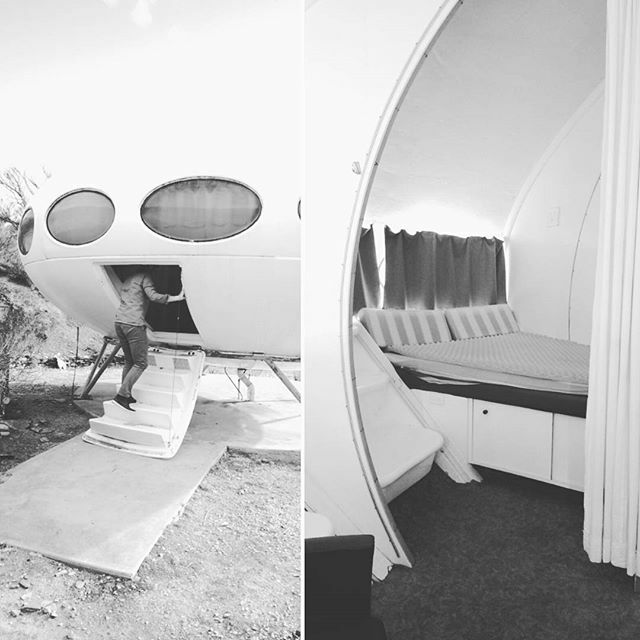 These four photos were taken by liam.jon_d on 082711 [which is now the latest confirmed date for this Futuro]. 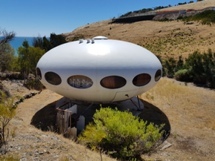 I particularly like the first one which is crystal clear and shows the Futuro in great detail. 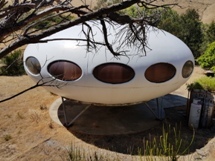 During its "past life" in Adelaide this Futuro was owned by Derek Jolly who is commemorated by the plaque shown below which features, among other things, his Futuro. 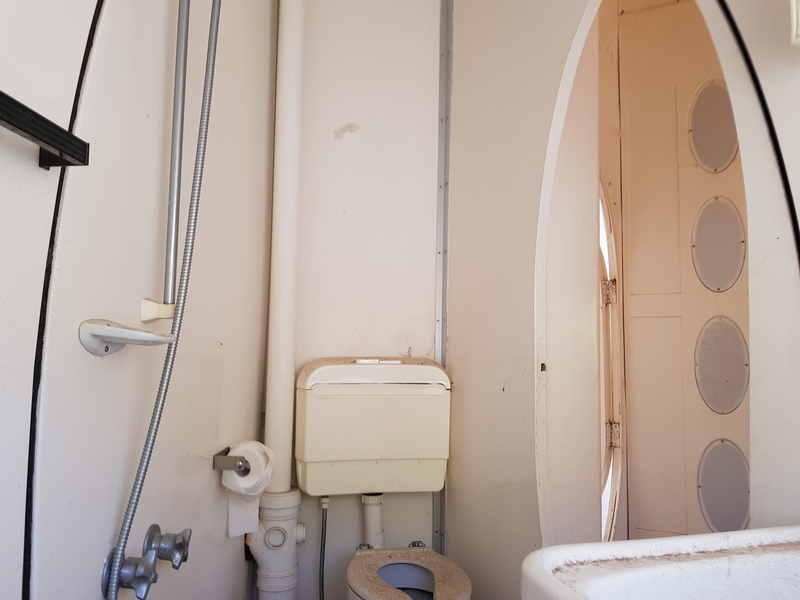 This photograph of the plaque is by superdiscobrakes and was taken 071108. 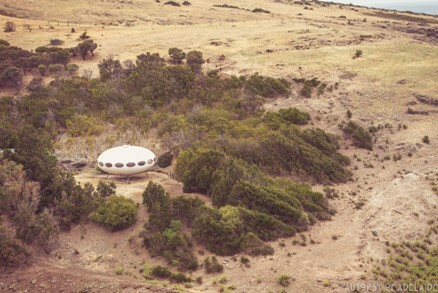 The photograph below is from the North Adelaide Society Inc Photographic Survey and shows the Futuro as it looked in 1976 when it was located on Provost St in Adelaide. 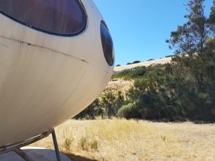 The photograph was taken as part of a photographic survey conducted during the late 1970s and early 1980s by members of the society keen to keep a photographic record of every property in North Adelaide at the time. It is displayed here with the permission of the North Adelaide Society. 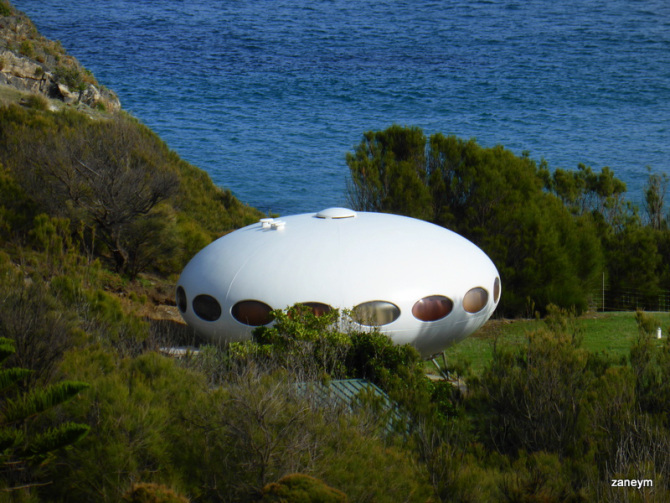 This Futuro made an appearance in a local newspaper The Advertiser on 050613. 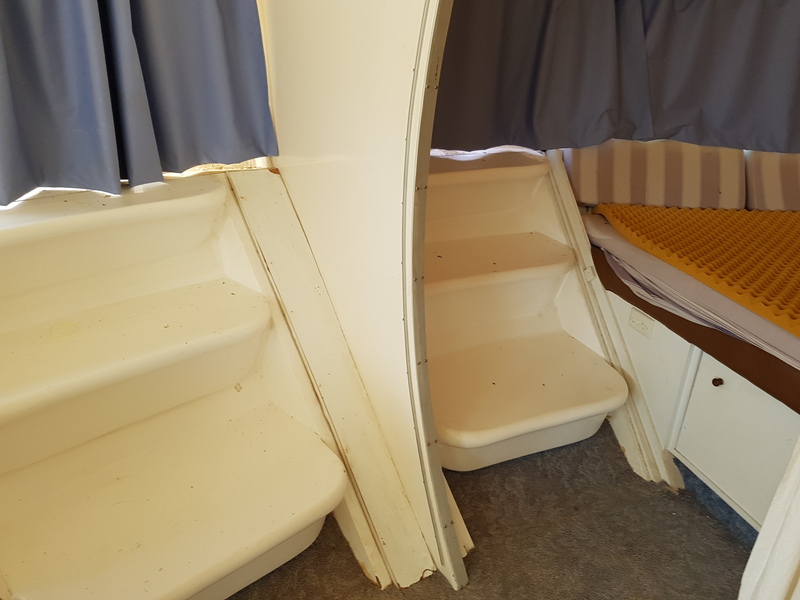 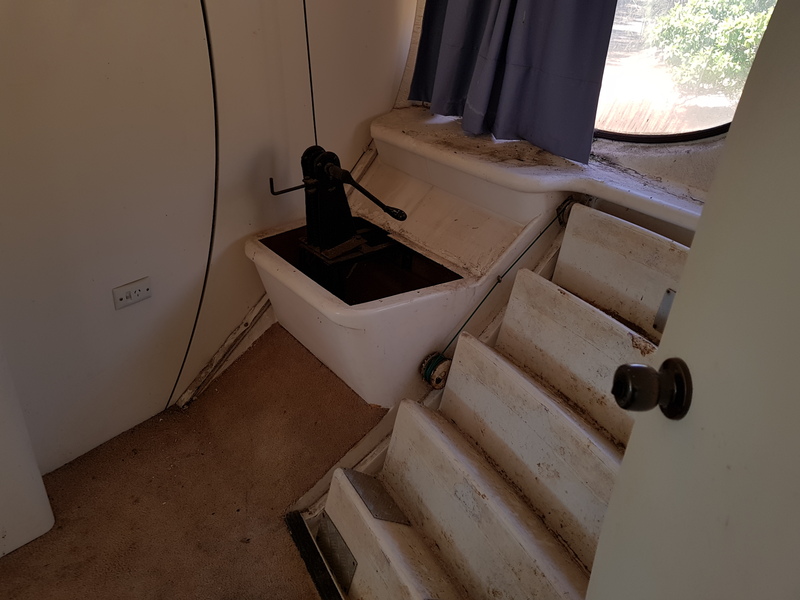 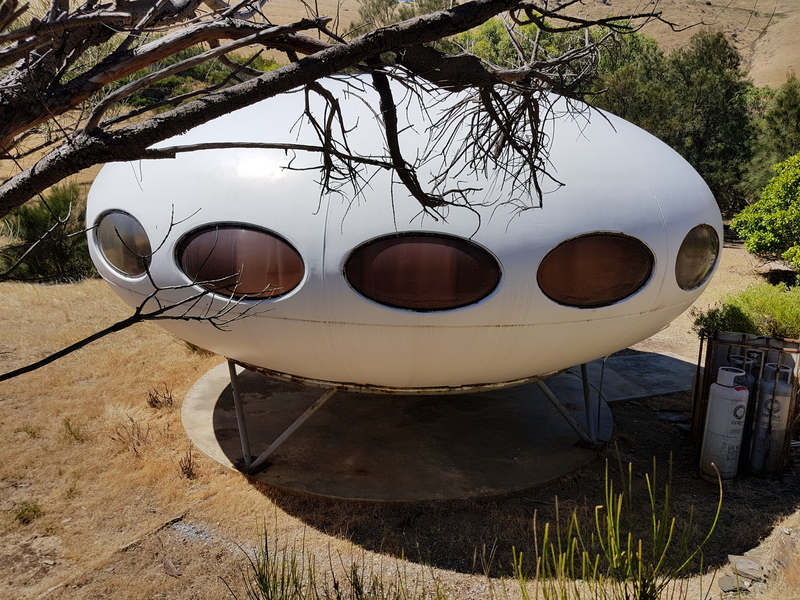 The article, seen below, included a nice photo of the Futuro in its current location as well as a smaller inset photo I had not seen before of the unit in its previous location in Adelaide. 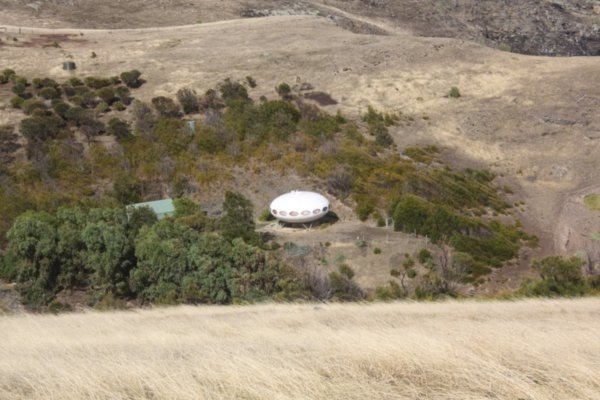 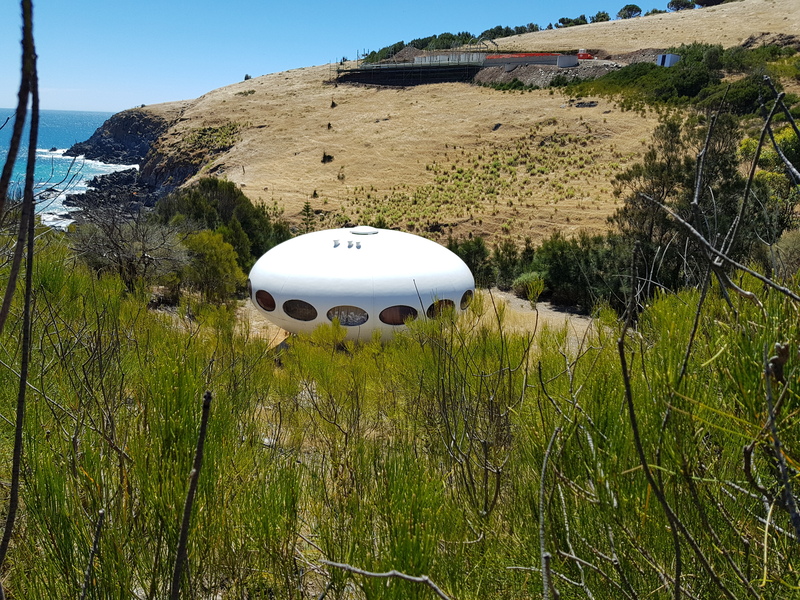 We also read in the article that in 1997 the Futuro and the rugged coastal land upon which it sits [12 hectares or approximately 30 acres] was put up for sale for $135,000; the article does not indicate if a sale actually took place. 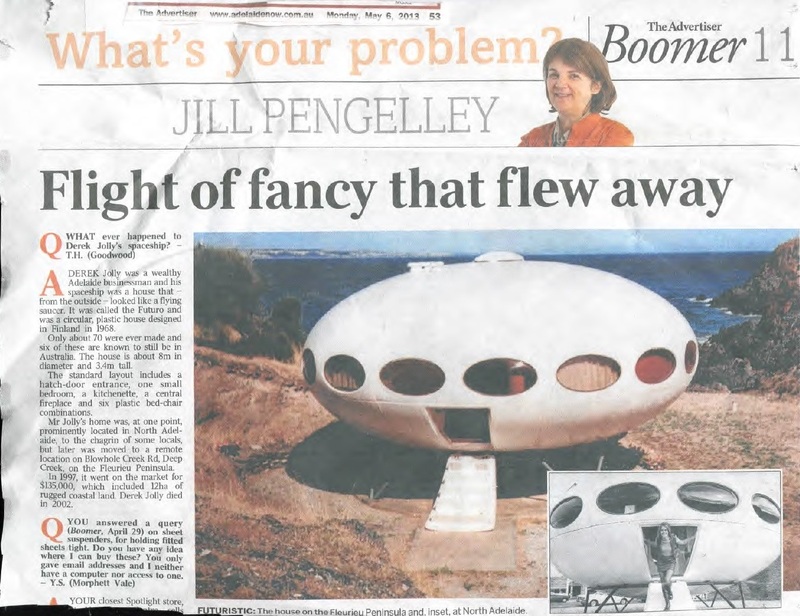 My thanks to Scott Hedges for sending me the information and the shot of the newspaper article. 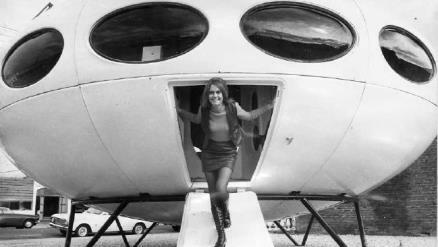 In a couple of June 2012 posts on the WeeGee Futuro Facebook Page Marcus Brownlow recounts the history of this Futuro. 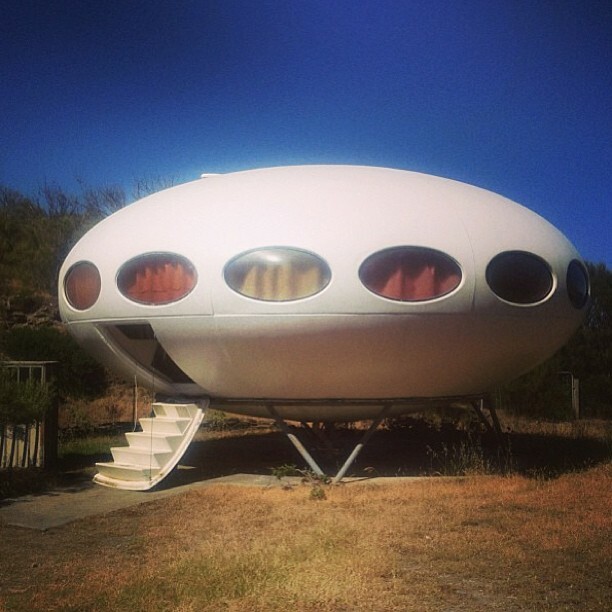 Marcus tells us that the Futuro was owned by a man called Derek Jolly. 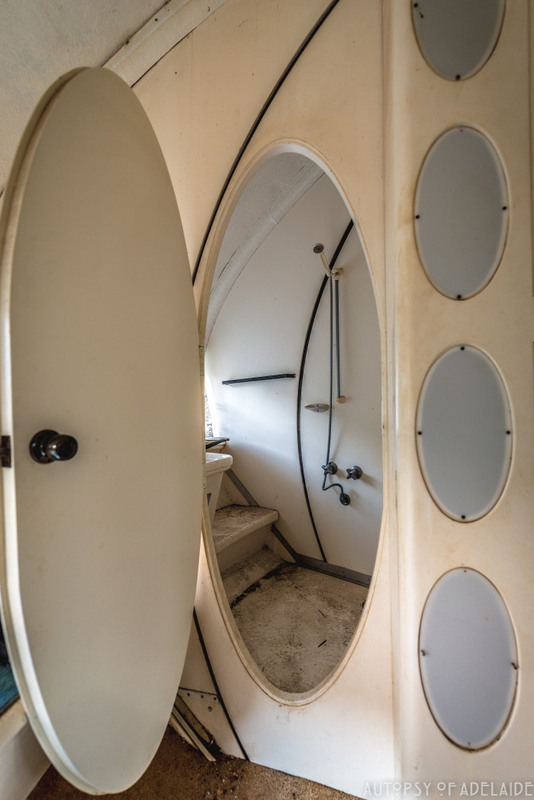 By all accounts Derek Jolly, a local entrepreneur, was a "larger than life" character. Jolley's Futuro "landed" on Melbourne Street in Adelaide in the early 1970's and apparently caused something of a stir among local residents who felt it did not fit with the character of the area. 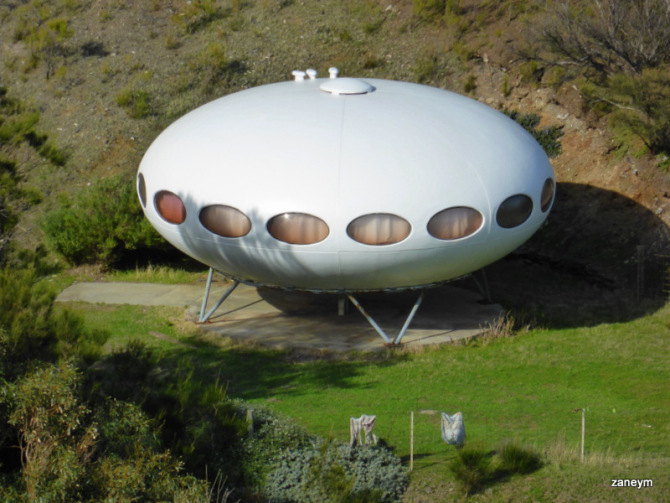 The Futuro was located on a vacant piece of land on Melbourne Street until the land was purchased for the construction of an apartment building. 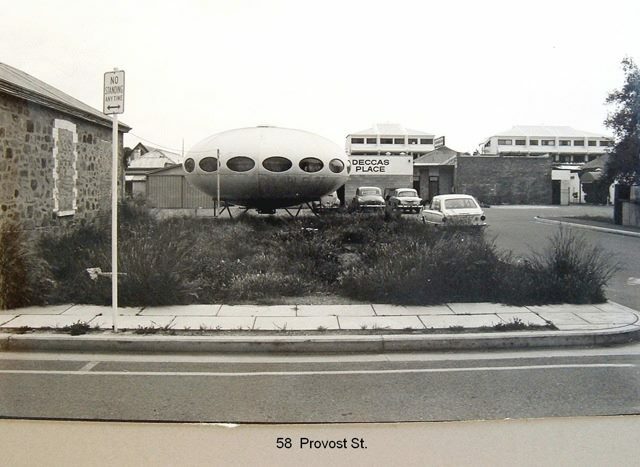 As a result the Futuro was then relocated to provost Street in Adelaide [see picture at left]. Sometime later the Futuro was moved around 100 km south to it's present location. 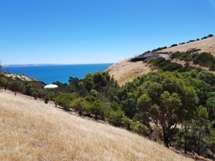 In 2005 Annabelle Collett [dead link - pdf here] was commissioned by the Adelaide City Council to create a memorial plaque to commemorate Derek Jolly. A photograph of the plaque can be seen at left. 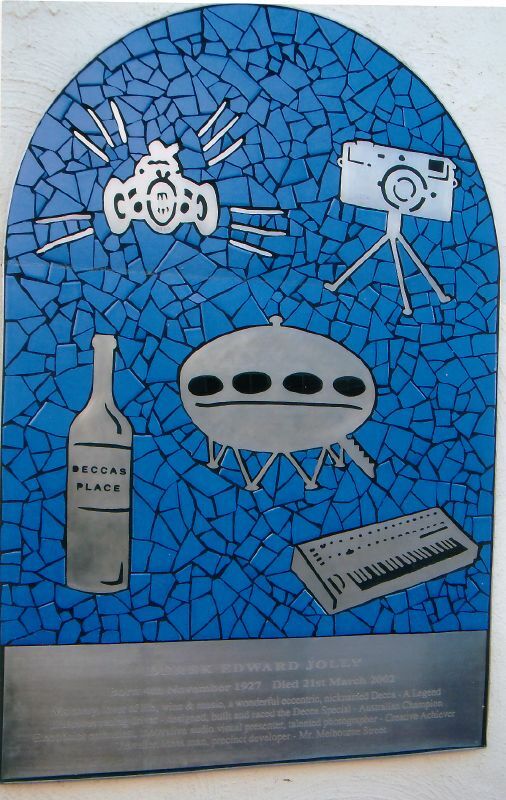 Marcus Brownlow tells us that the images on the plaque represent Derek's Jolly's passions; car racing, photography, music, fine wine and, in the center, his Futuro. The same history, though in less detail, is also recounted in an 031810 blog post on the 891 ABC Adelaide website. 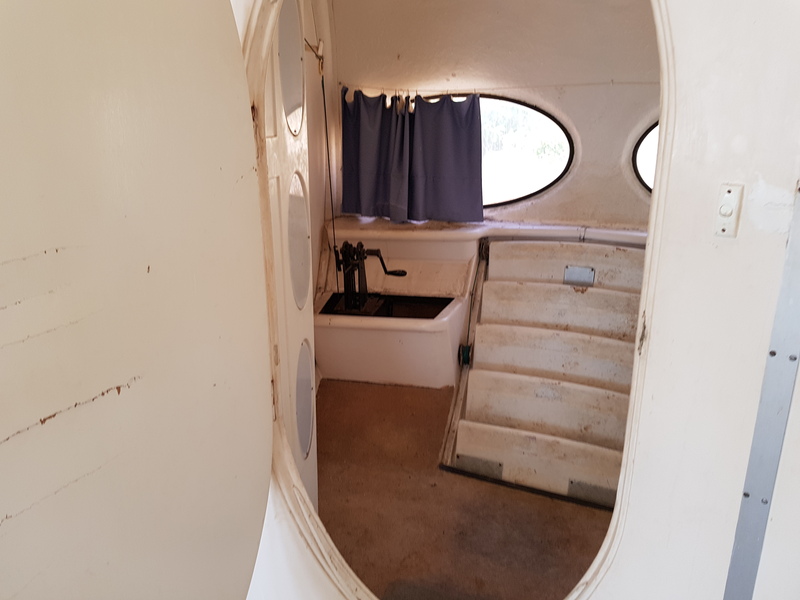 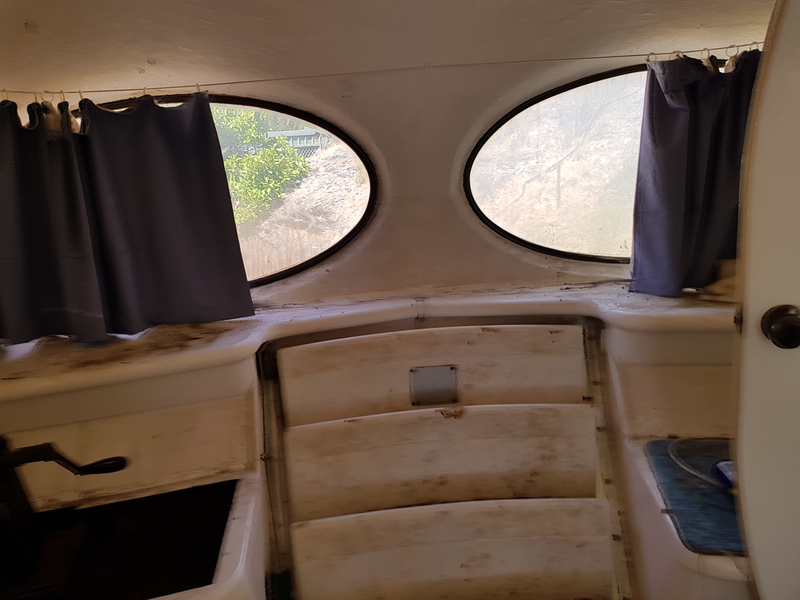 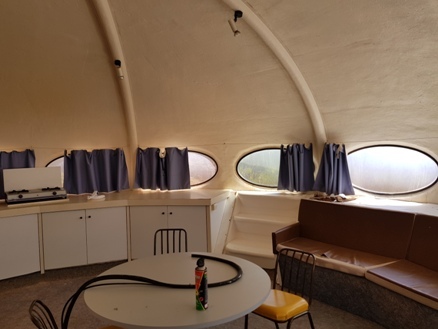 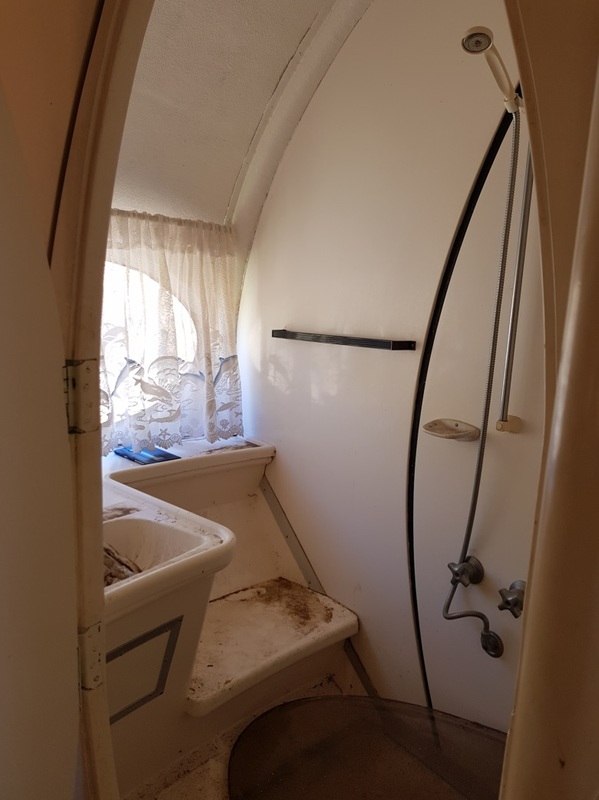 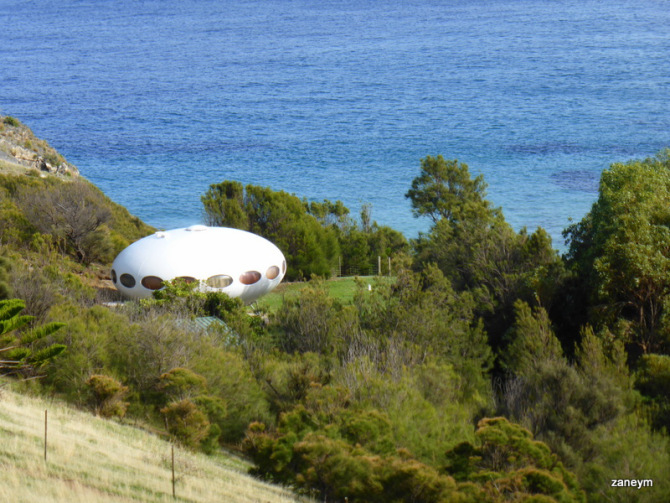 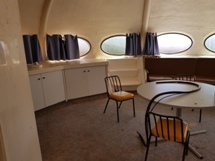 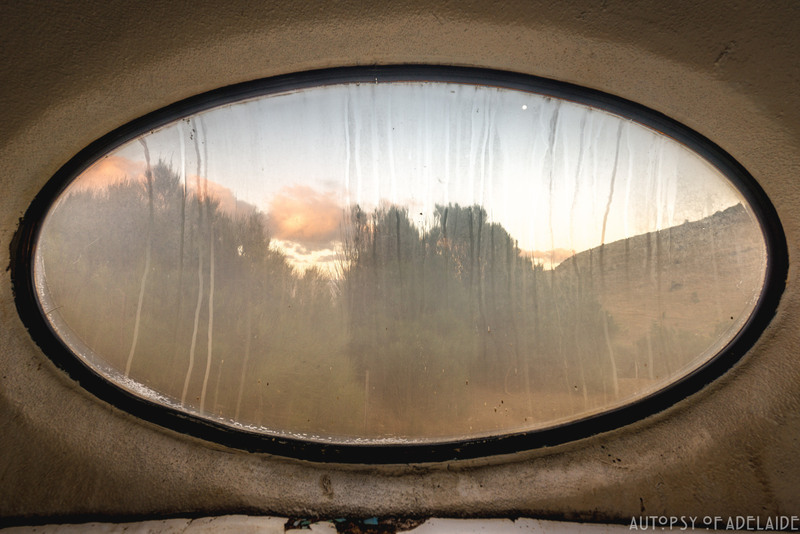 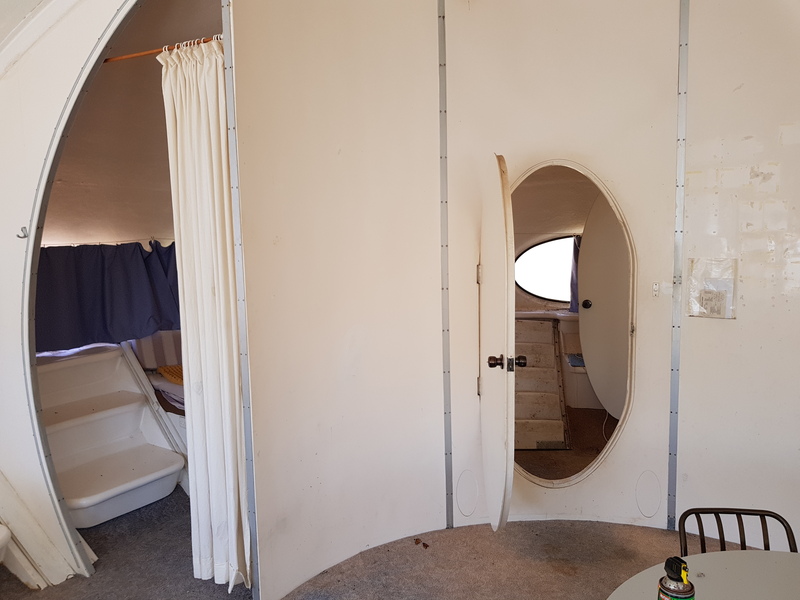 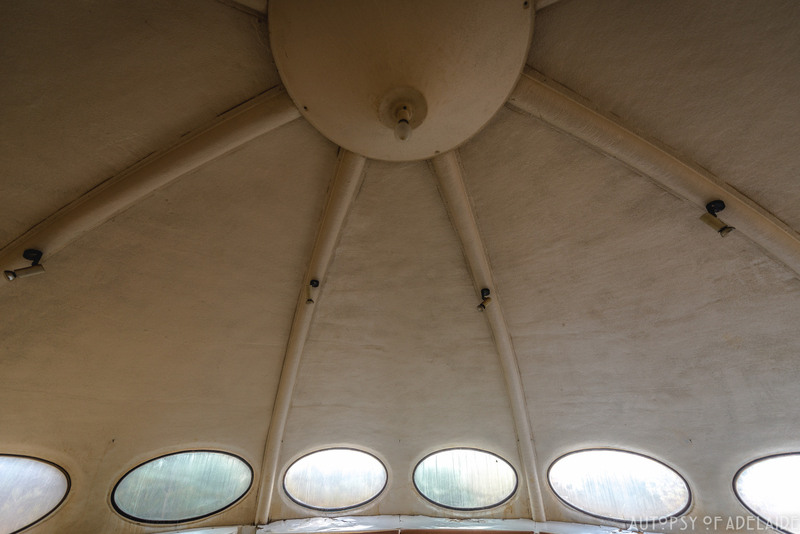 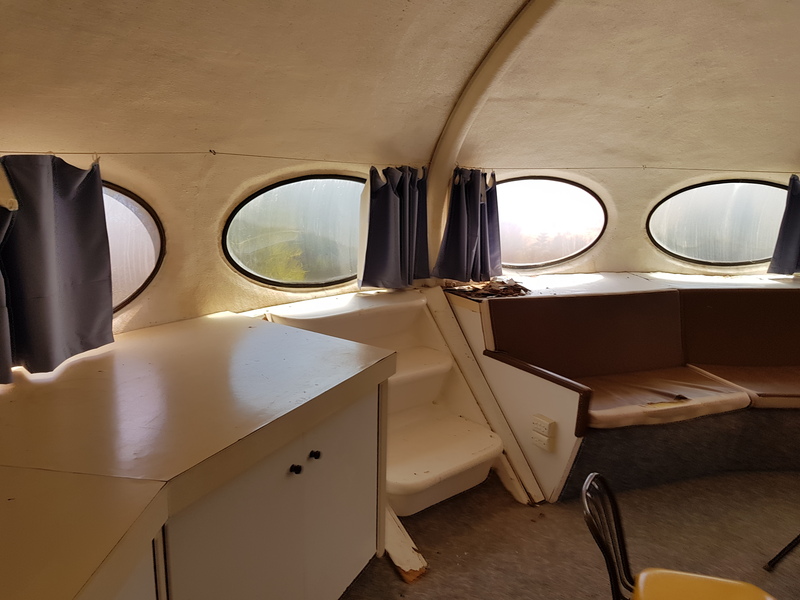 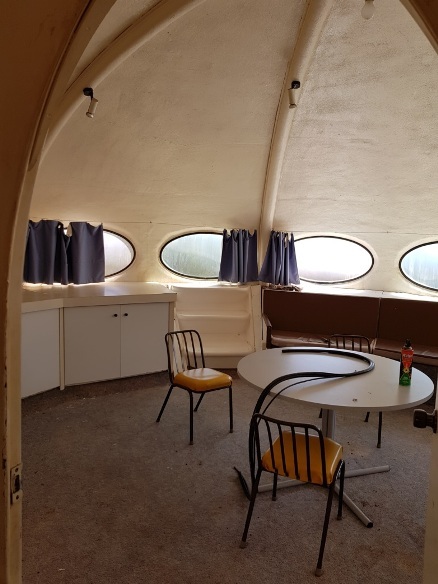 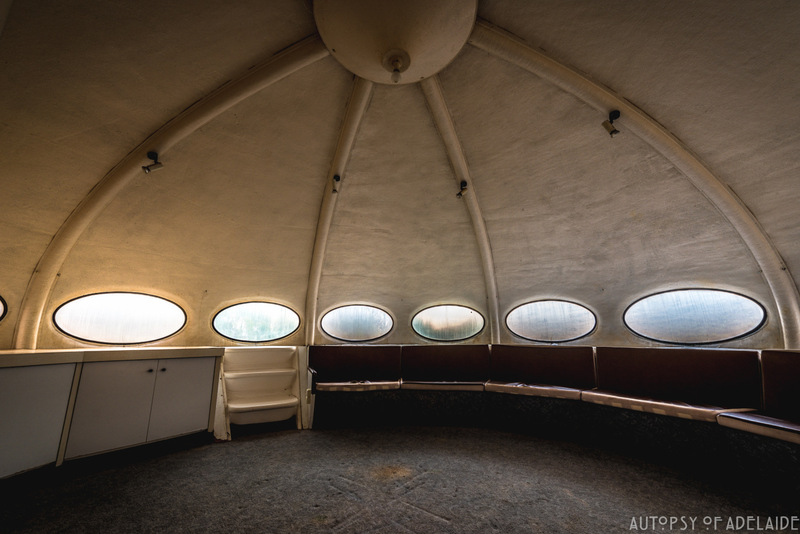 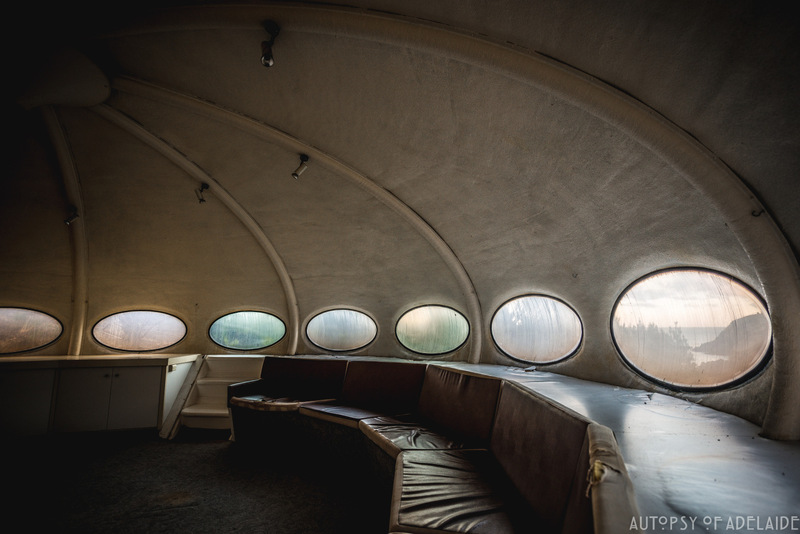 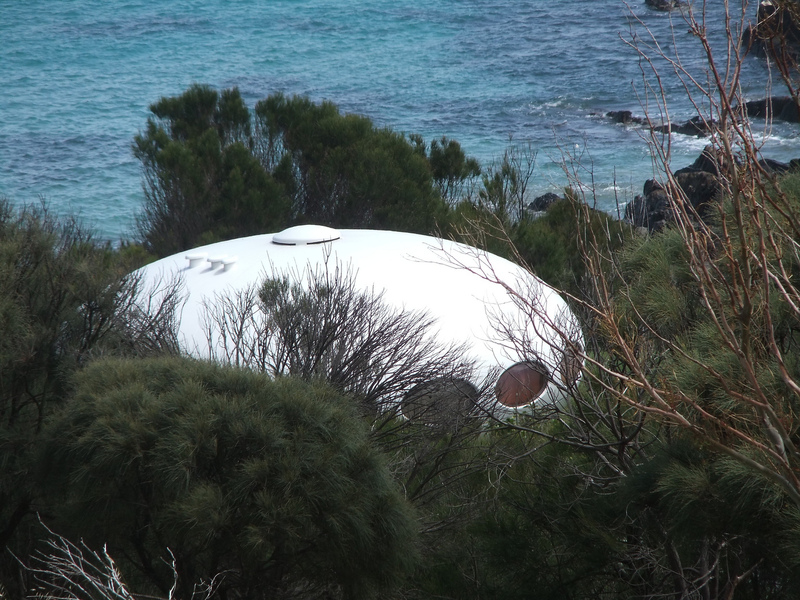 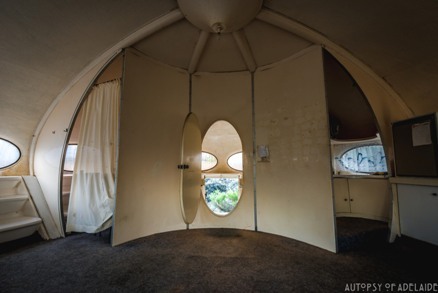 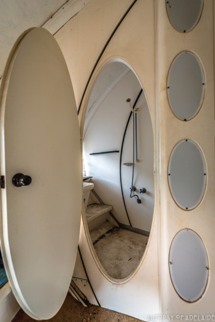 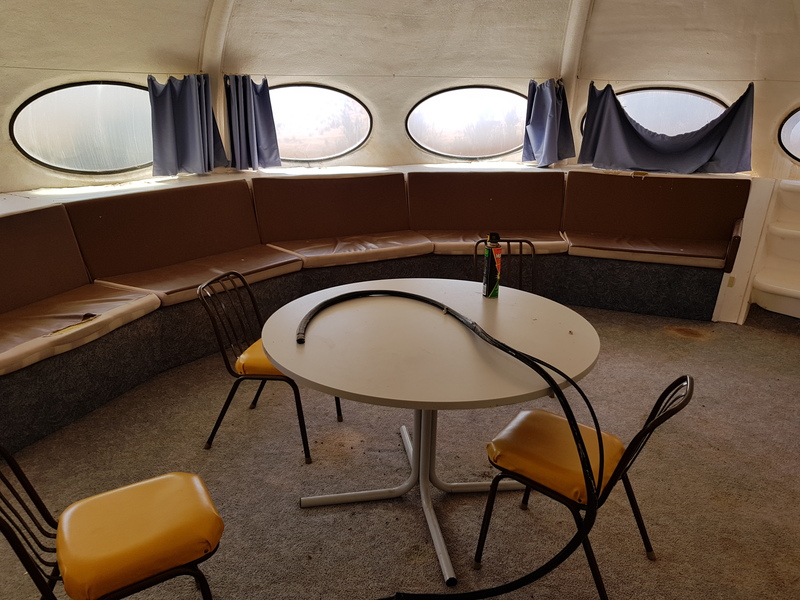 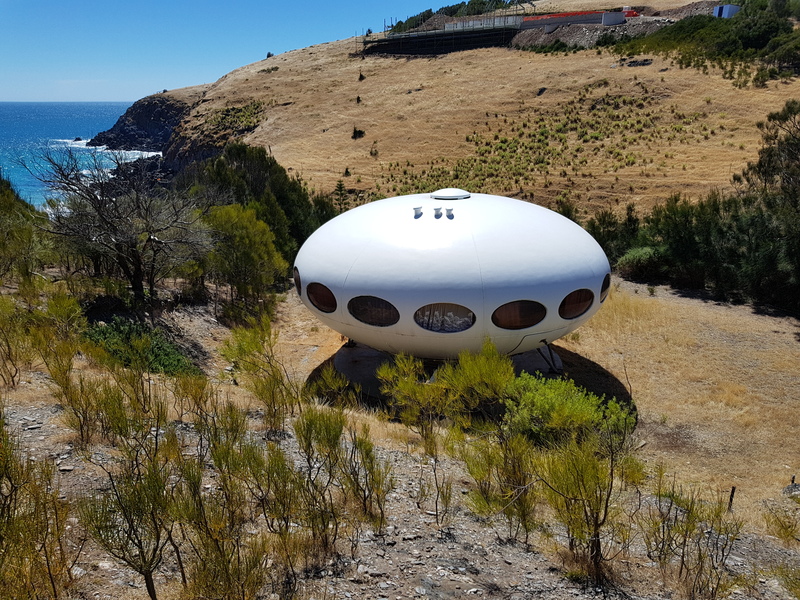 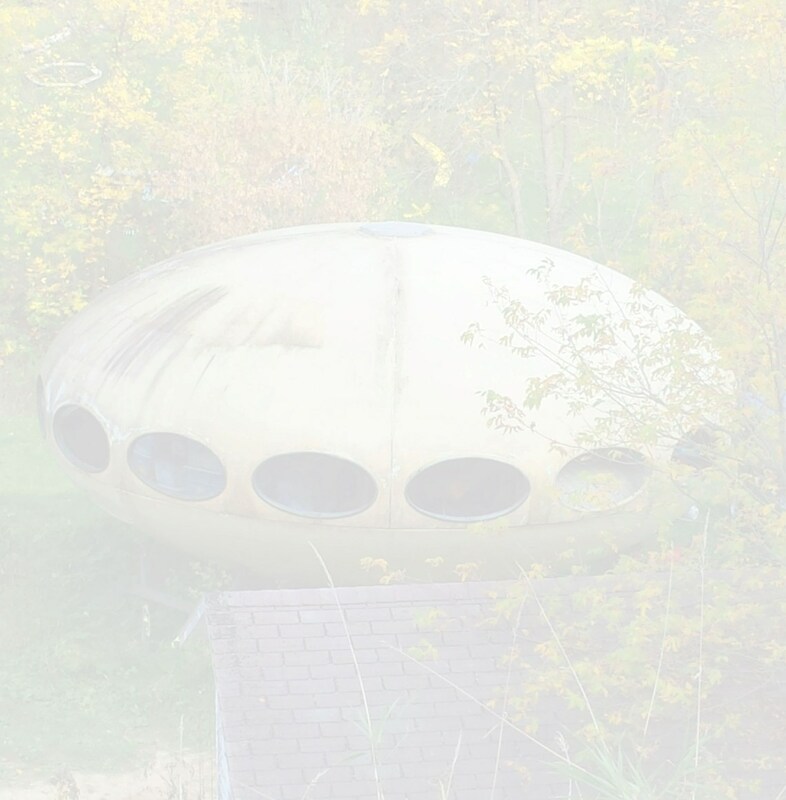 While searching for Futuro House information the other day I stumbled upon a blog by ATTS on the site TravelBlog the other day. 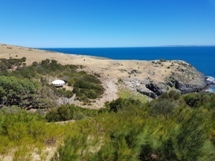 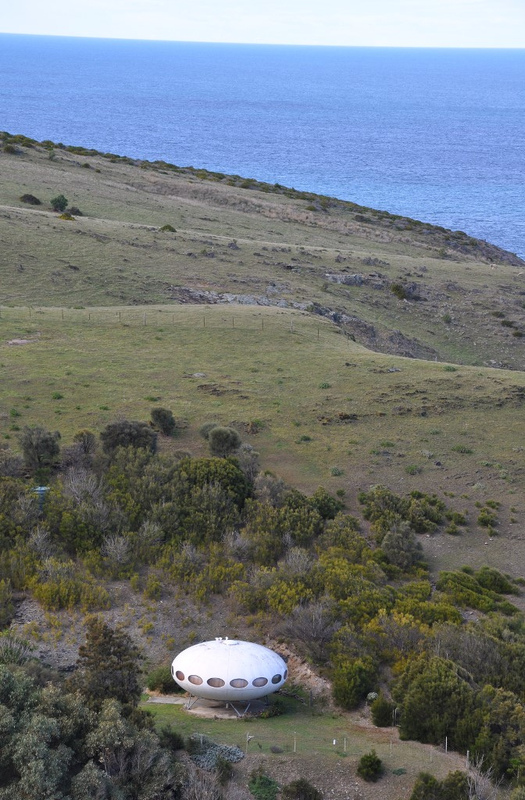 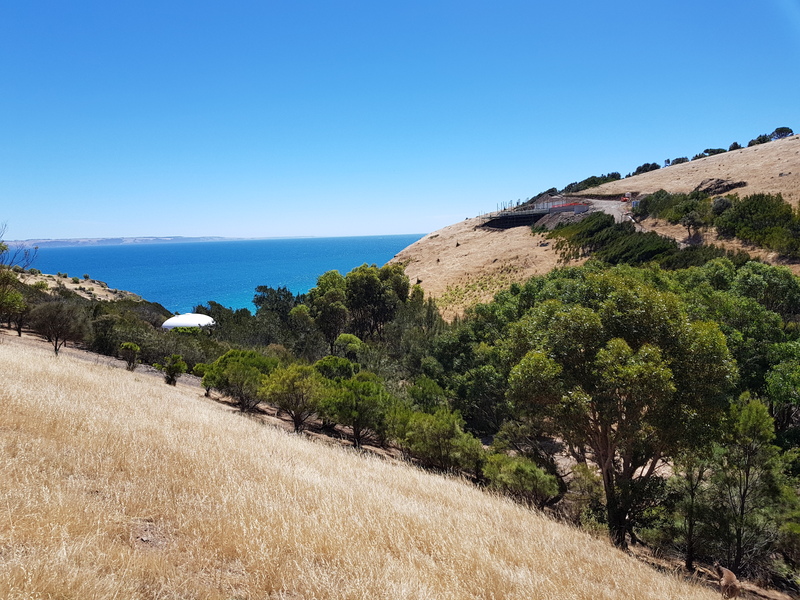 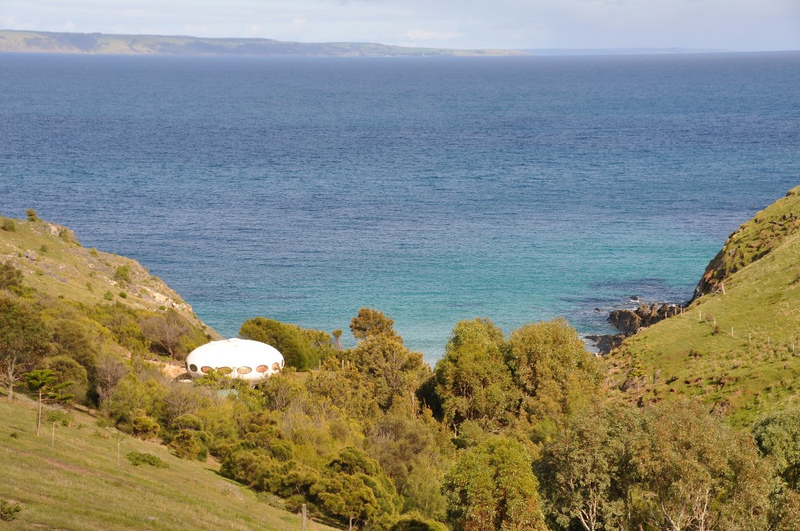 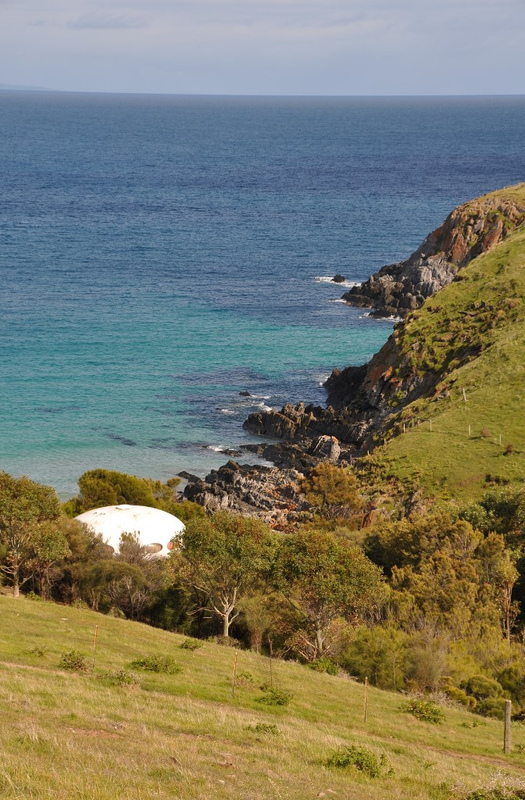 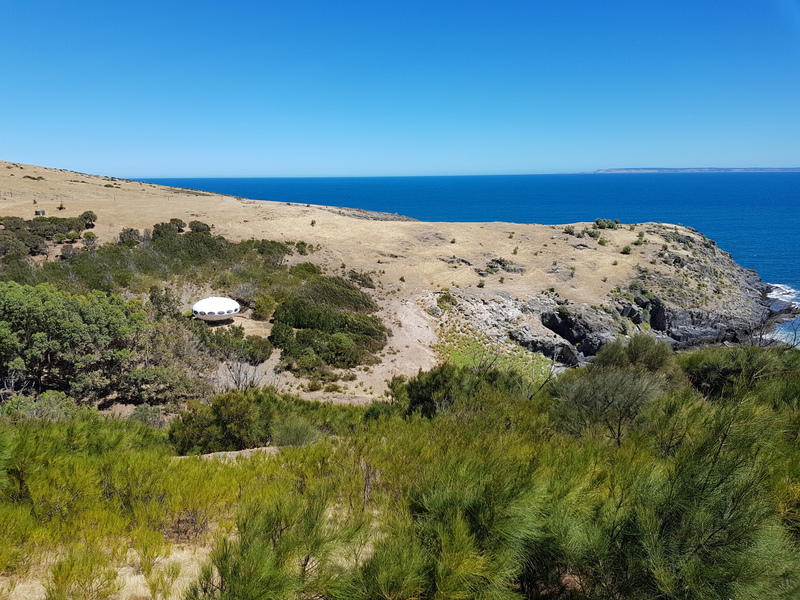 The blog is an interesting account of walking the Heysen Trail [Get this! 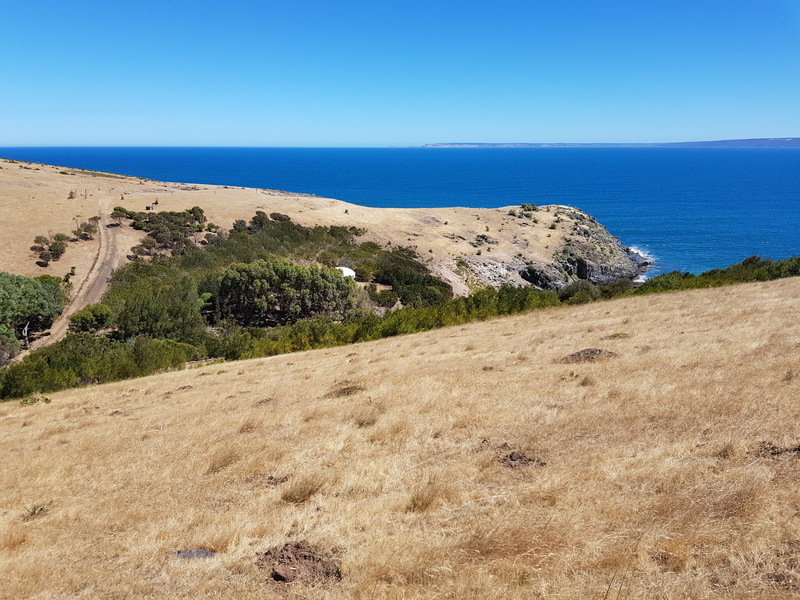 A 1200 km Walking Trail] in South Australia; ATTS is a braver man than I. 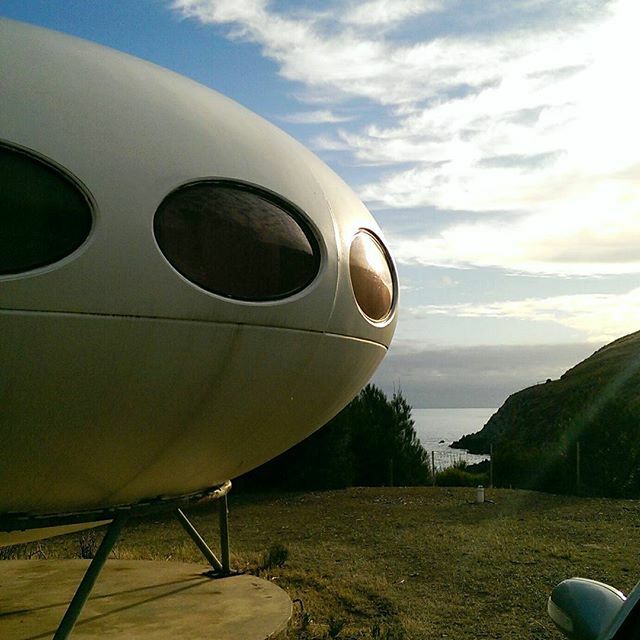 Anyway on the blog was an image of a Futuro [new to me] seen along the way. 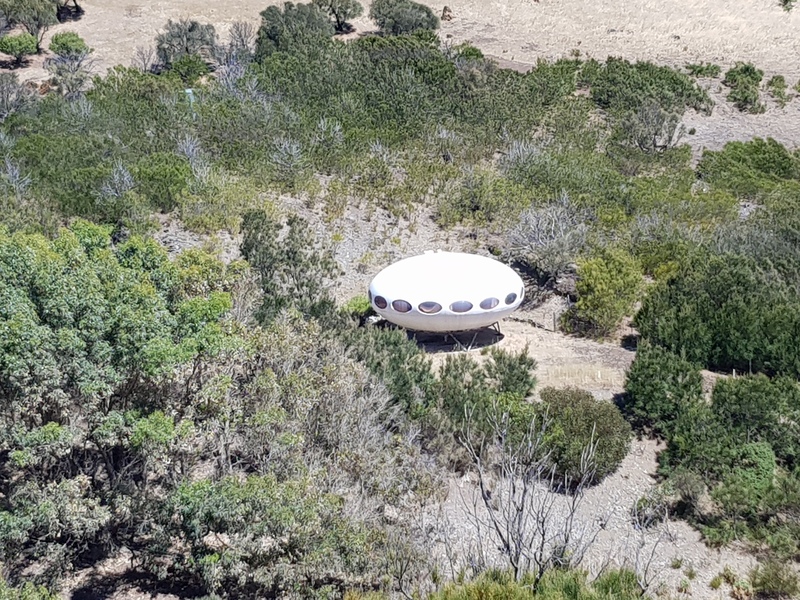 Some work in Google Earth and Google Maps confirmed the Futuro as being on site as at 012310. I have not been able to find any other information about this Futuro so if you know anything or have images I could use please do let me know. 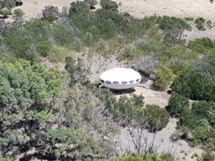 Google Earth satelite imagery dated 090918.